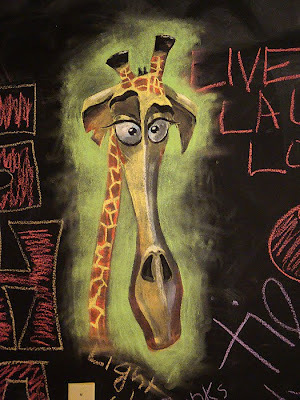 My sister wanted me to draw something on her new chalkboard bedroom wall, so I picked up a pillow that was sitting around that had a picture on it of the giraffe from the movie Madagascar. Personally, I thought the movie wasn't the greatest, but this image made for good practice with trying out an artsy-looking drawing using sidewalk chalk. It was a fun challenge cause I ended up blending with my fingers, slightly erasing off some colors and then blending them into the black of the chalkboard to get them to be darker, and using a damp paper towel to erase out areas to get an almost black. This took about 2 hours and is about 2 and a half feet tall. Thanks Briggzzz. Half-way through another one now as we speak.